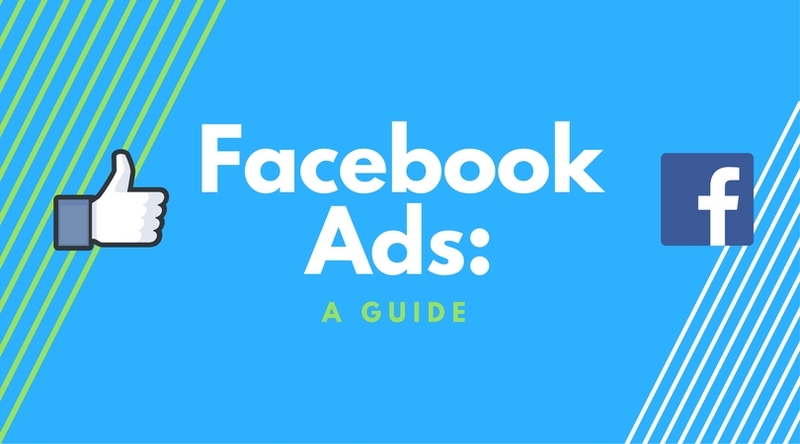 This blog post is part 2 in our two-part series on the Facebook advertising landscape (click here to read part 1 before you continue). One of the most confusing aspects of Facebook ads is understanding the difference between different types of ads. How does a content creator know which one to use? Which type of ad will best reach my target audience? How can I ensure the best conversions and engagement? What is the difference between boosting a post and promoting a post? Not to worry, this blog post will answer all of these questions and more. Sponsored stories are built around user activity. Essentially, when an individual has some sort of interaction with a page (likes, comments etc. ), advertisers pay to highlight that action with a sponsored story that is generated for all of that individual’s friends to see. The goal of Sponsored Stories is to get more users to take the same action as their friend has. 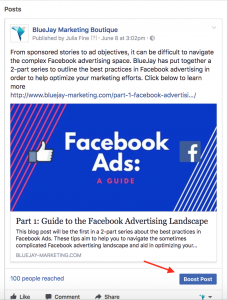 The difference between a sponsored story and a page post is that a sponsored story is a single action (usually there will be a call to action button) as opposed to a page post, which gives multiple actions (like, comment, share, etc.). A targeted boosted post typically is trying to drive traffic to a website. 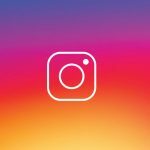 Boosting a post is exactly what it sounds like – giving the post a push to increase engagement and traction. When you boost a post, you have the option to push the post to “People who like your page and their friends” or to “People you choose through targeting” which would be classified as non-fans. Boosted posts also can seem more like an ‘organic’ Facebook post and less like an ad., which in turn may result in higher user engagement. In promoting a post or page, the page owner has much more targeting options and thus it is used for more functions. Promoting is used to build an audience (if you’re trying to reach a new audience, this is best), create business-awareness (targeting people geographically), or optimize ads in order to get target audience to click on a specific page on your website (i.e. during a sale). Promoted Posts are only shown to a page’s existing fans, with an option to reach friends of fans as well. Another benefit to the promoted ad over boosted post is that you can add a call to action button to the post such as, ‘sign up’, ‘learn more’ or ‘shop now’. This drives user engagement and makes it easier for you to ensure that your target customer ends up on the landing page of your website that you want them to arrive to. The problem is that most people do not know the difference between boosting and promoting and often use boosting because it is easier to use when promoting can actually be more effective. To get started promoting a post, click here and select Page Post Engagement. Use the drop-down menus to choose the page and the exact post you want to promote. 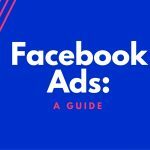 I hope that this blog post series has helped you to better navigate the Facebook ad space. Although it can be a complicated process, it is a great social media advertising tool.